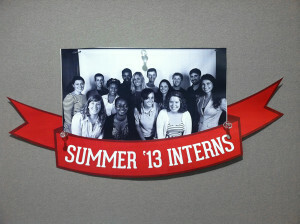 This summer I have had the privilege of interning at Allen & Gerritsen, an advertising agency in Boston, MA. I am the Creative-Art Direction Intern. As an Art Director I have helped design ads, logos, flyers, emails and webpages. I have already gotten to work with many of the agency’s clients including, Staples, The Museum of Science, D’Angelo’s, Papa Ginos, and The Boy’s and Girl’s Club. The interns also have their own client, Janji, a running apparel company committed to help solve the global food and water crisis. We are building a campaign of sorts to boost awareness about their brand along with the food and water crisis. This summer has given me the opportunity to put my design skills to use in a real setting and learn the ins-and-outs of advertising. Some of the biggest challenges have been working with clients requests and fitting in all the required information in a design. All the people I have met this summer, from fellow interns to employees, are wonderful and have taught me so much. I love coming to work every day and I would highly recommend this agency to anyone interested in advertising.